Evitar los posibles retrasos y complejidades del uso del transporte público. Relájese en un cómodo vehículo privado con aire acondicionado y un conductor profesional. 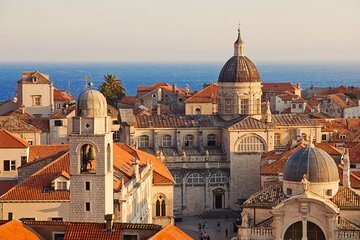 Esta transferencia privada en un solo sentido es la mejor y más fácil manera de viajar entre Split y Dubrovnik en Croacia. Simplemente haga la reserva y proporcione los detalles de su hotel o alojamiento. La transferencia se confirmará de inmediato y se le entregará un cupón de viaje para ofrecer al conductor. Aproximadamente de 24 a 48 horas antes de la transferencia, vuelva a confirmar la hora y el lugar en que desea que lo recojan y ya está todo listo. Es fácil. Cuando llegue el conductor, súbase al automóvil con aire acondicionado durante aproximadamente 3 horas en automóvil entre Split y Dubrovnik. Siéntese y disfrute del paisaje de la hermosa costa sur de Dalmacia, mientras atraviesa pueblos de pescadores tranquilos y rústicos y un tramo de hileras que es memorablemente hermoso. Llegarás a Dubrovnik sintiéndote relajado y listo para ir. Ya sea que viaje solo, en pareja o en grupo, este servicio privado de transferencia en una sola dirección es la manera fácil y sencilla de llegar de Split a Dubrovnik. Our driver was great and once we got started the trip went very smoothly. Unfortunately there was some kind of administrative error and we got off to a late start which was frustrating. Trip was ok but driver had difficulty finding his way out of Split and then drove very fast in an ordinary not a high performance car to make up time. Our driver was prompt in picking us up from our hotel. He was actually early which was nice, he stopped along the way for a little break to use the bathroom and get a snack. My only complaint was that he drove fast and was passing other cars very often. My daughter and I were a bit fearful at times because he passed on narrow windy roads on the mountainside. One time he passed multiple vehicles at once at least 5!. No exaggeration. There was a truck in front that was slowing traffic and he wanted to get right behind the truck , which he did, so that when he had the opportunity he could pass the truck as well. This was a quick way to get from Split to Dubrovnik - it took us 3 hours. However, the road was extremely curvy and the driver was going very fast which made some of my fellow travelers car sick. The driver was nice, personable and professional. Next time I would investigate flying to see if it was comparable in price as I imagine it would be comparable in time.